Take a look at the Bayou #2 files. The Henchman spawn location called FRG_SimpleSbire_Pont_1 is editable! It's one of the only ones that I've found so far that are in the editor at all. Would it be possible to find out what differentiates that spawn location from all the other ones in the game that aren't currently visible? Maybe this information helps you in some way; I have no idea what the process of finding these objects is like. Whoa, this as certainly escalated quickly. Good job! Shrooblord wrote: When you say redefined, do you mean that the model itself is hard-coded somehow? I.e. its shape and geometry (vertices in 3D space) are pieces of code rather than what we would nowadays expect from models as separate object files with rotational data inside a larger 3D environment? Yes. Take note of the fact the cages all come in slightly different shapes and sizes. Regarding the rotational data though, I'm not entirely sure, but I think so. If not, the rotations might be stored in a hardcoded initial matrix for the object. Shrooblord wrote: My dad always seems to bring that (and especially how hard it is/would be) up when we talk about 3D engines and making 3D games - I suppose that's because that's how they used to make 3D in the early days, which is when he was involved with the field. You never mentioned your dad was in the field. Shrooblord wrote: Take a look at the Bayou #2 files. The Henchman spawn location called FRG_SimpleSbire_Pont_1 is editable! It's one of the only ones that I've found so far that are in the editor at all. That's interesting, nice find. 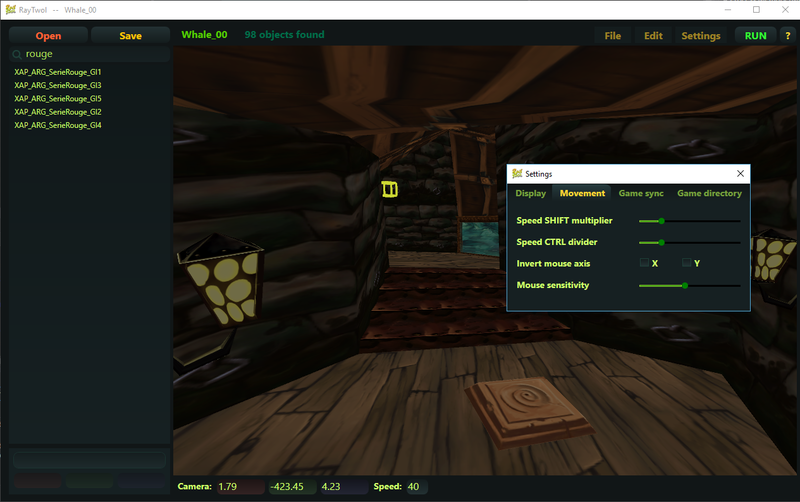 I'll have to play around with it, since I want to see how the pirates' mechanics and waypoint system function. Shrooblord wrote: Would it be possible to find out what differentiates that spawn location from all the other ones in the game that aren't currently visible? Maybe this information helps you in some way; I have no idea what the process of finding these objects is like. I'm not sure if it'll be useful, but I'll take a look again in a bit. After that I'll be taking a look at editing world geometry. Note that this doesn't involve being able to change the structure of the goemetry or model/import anything new, it'll only involve being able to move around (and rotate!) elements and vertices that are already there. As for Rayman 1, the only major issue at the moment is working out resizing the events list in each level. RibShark and I have delved pretty deep and only have one more seemingly small obstacle to overcome (which says nothing for how difficult it'll actually be), so once that's sorted, it should be ready for release. Though, I still haven't looked into event linking yet, so it won't be totally fully-featured (if it turns out to be pretty simple, I might even be able to get that out for the first release as well). I don't think there's much I can really say at the moment. You guys have been making some great progress and I'm really happy I can see this all unfold. It's crazy to see Rayman 2 modding possibilities become ever more feasible, and I wish I could do more than just cheer you folks on. Also, I'm beginning to really wish I could use dual monitors, it's very nice to be able to view things with clarity side by side, and it looks particularly handy here. It does is when you want to multitask. I sometimes use my TV which is side to my display to expand my work area. EDIT: Ad, do you think that if you manage to create a dialogue editor, it will be possible to do fantranslations? I know, but it seems I finally managed to extract the text file after some fighting in how to make this work. It is translation time! Like all other objects, a Pirates' moved spawn location won't trigger them to spawn if that point is somewhere in the level before Rayman walks into the area where the object is loaded into the world, or dies into a Try Again. This area is generally very small. Take the Bayou #2 - from the platform below the Piranha, the Pirate will only spawn if he is somewhere on the last (the one where he'd originally spawn in the first place) or second-to-last platforms: the others are too far away to trigger the spawn. Way points seem hard-coded or at least not yet exposed to the editor: I've tried moving around the tiny spiders in the Sanctuary of Stone and Fire's Temple, but that causes them to walk through the air towards their actual waypoints when their walking behaviour is triggered (which, admittedly, is hilarious). 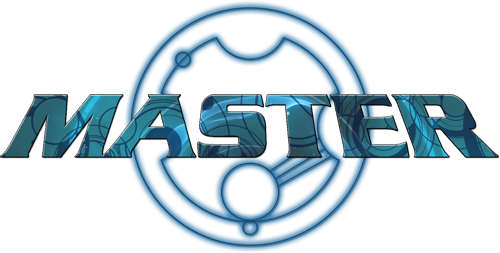 Adsolution wrote: For the next update of RayTwol, there will be in-game sync features for sure. 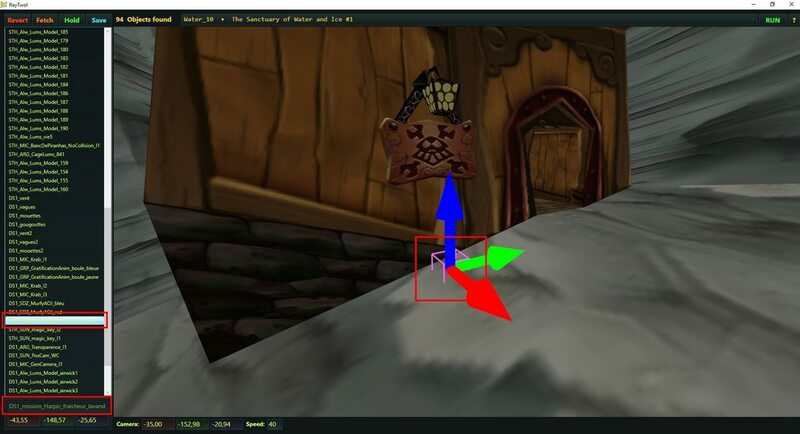 You can currently manipulate both Rayman and the camera in real-time. AWESOME!!!! This will save me SO much time and hassle while playtesting (#playSoSaF'sFirstSectionTwelveTimesOverToGetToTheInnerSanctumAndTestWhatYouActuallyWantedToTest). It's also a very, very, very cool feature regardless. Haruka wrote: EDIT: Ad, do you think that if you manage to create a dialogue editor, it will be possible to do fantranslations? You know there's already a way to edit the Rayman 2 dialogue, right? I've already been at it avidly. Actually using your playthrough videos to find which lines they say in the cutscenes exactly and find those entries in the dialogue file. Haruka wrote: It seems I finally managed to extract the text file after some fighting in how to make this work. I already played around with Ad's tool and found weird things like this. Nice to get my regular dose of nightmare fuel. 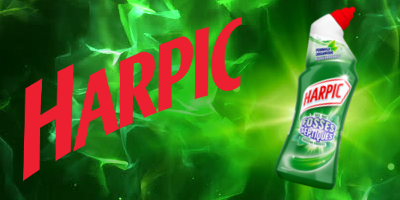 Wait... Harpic? 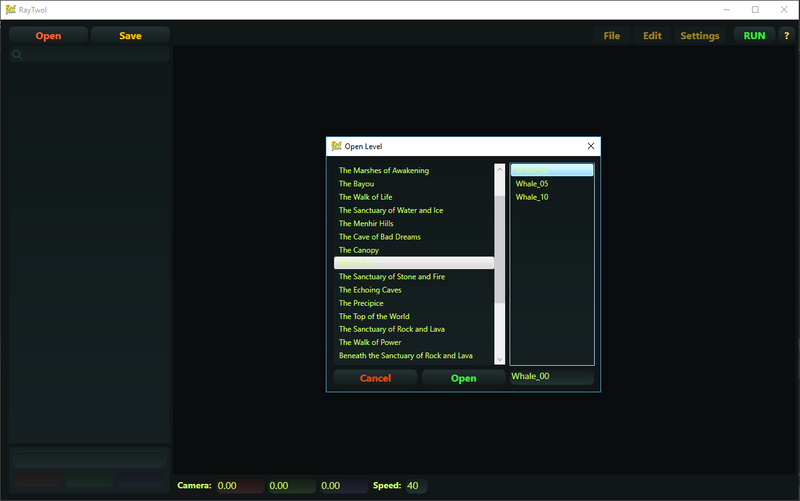 What are you doing inside Rayman 2's Sanctuary of Water and Ice level files?? Shrooblord wrote: Wait... Harpic? What are you doing inside Rayman 2's Sanctuary of Water and Ice level files?? The Great Flying Poo moves in mysterious ways. Haha, I noticed about that and was wondering if those names were the original level files' ones. All of the names are read from the level files, so yep. "Vidange gratuite"/"Free dumping" for whichever pirate can figure out how to get into the temple. I guess there was a bit of toilet humour going on there during the development! Funnily enough, the Blue Lums that are in that part of the level are also called "DS1_Alw_Lums_model_airwick1" through "..._airwick4". Adsolution wrote: All of the names are read from the level files, so yep. Epic coincidence to me then. I guess there was some sort of "stinky sewer" theme they had in mind for that level which they later dropped (or moved to other levels). Yesterday and today I've been cleaning up the interface (the style is now borderless with rounded edges) and incorporating some handy new features, including a proper open level window, settings (with axis flipping as per Ambi's request) and an object search bar. Upon opening a level, the camera now also teleports to a convenient place so you don't have to hunt it down through space. Hold and Fetch have been moved to the File menu, allowing you to save and load as many different versions of a level as you like. I hope to have the hot-update syncing and project management features complete for the 1.1 release. As much as I like the work you're doing for R2, I'm more intrigued with the tool being used for R1. It'll be like getting the PS1 version of Designer that never happened. Any chance we could see a release for R1 this month?